Often in the spell of the kitchen, Contilo Pandeleon stirs memories of the limpid blue Aegean, the faint scratchy sound of a haunting bouzouki, her father's broad, beaming smile the whiteness of island stone. Never, in such shimmering heat and familiar topography, did she ever imagine preparing a sumptuous Greek meal for an American president. Especially for a free-world leader who likes to eat. It was, of course, a political affair -- a $1000-per-plate fund-raiser last May at the showcase home of Sacramento developer Angelo Tsakopoulos. All the state's Democratic Party luminaries were present. One assumes rubbing shoulders among the powerful is mildly appetizing. But good food knows no agenda and Contilo Pandeleon was taking no chances. Thus, her catered meal was a banquet of Republican proportions -- smoked salmon, sweetbreads, jumbo prawns, grilled New York strips, roasted lamb on a spit, plus such homemade specialties as spanako tiropita. Her lasting impression -- call it a heavenly dessert -- was a fleeting glimps of President Clinton leaving the party in a limousine, a plate of her lamb chops in his lap. "It was very flattering," says Pandeleon of the assignment. "Very special for me to cook for the president. I never dreamed in my whole life to do something like that." Angelo Tsakoupoulos -- the son of a butcher, a poor immigrant waiter blessed with a Midas touch -- has become this city's reigning symbol of the American dream. He can transform farmland into a subdivision. Contilo, on the other hand, can turn ordinary lamb chops into a tender lyric. Pandeleon's odyssey to this shore has been no less instructive. Her's is a classic Greek recipe for success. Contilo Pandeleon is from the tiny island of Paros, in the Cyclades chain in the timeless Aegean. Her father, Miltiades, dug wells, peddled fish and chiseled island stone for houses. Her mother, Katerini, baked bread in an outdoor oven using a long wooden paddle. There were seven children. Miltiades also ran a small cafe adjoining their house. As a little girl, growing up in the 1940s, it was Contilo's task to crank the gramophone, to tip the stylus on a raspy platter. Later, she was allowed to serve water, to clear the tables. She observed her father cook, watched her mother knead the dough. When she was 8 years old, Contilo was sent to Athens to live in a fashionable household, to labor as a servant girl. Such exile from home, Contilo says, was customary at the time. Though she lived for a while in a Greek senator's home and served other prominent people, she also endured her share of cruelty and abuse. She never attended a day of school. "We were very poor," she says of her family. "All the children had to go out and find work. I had a very hard life. I never talk about it before. This is the first time." Saying that, Contilo begins to quietly sob, so aching still are the memories. When she was 19, under terms of indenture, she immigrated to Canada, a country that needed unskilled labor. She spoke neither English nor French. Her first job was as a hat-check girl in Montreal. Later, she became a waitress. Often she held down two jobs at once. She met Nikos Pandeleon, a boy from Kiffisia, a suburb of Athens, who was working as a plumber. Together they operated a cafge. In 1976, urged by now-retired restauranteur Nick Galaxidas, a longtime patron of Sacramento's Greek community, the Pandeleons came here. Then encouraged by Stelianos Spyridakis, a professor of Greek history at the University of California, Davis, they opened a small restaurant in Davis. 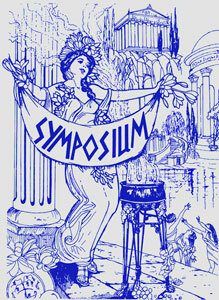 They called it Symposium. "A place you get together," says Contilo of the Greek name. "Eat, drink, be happy. And that's what happened." She smiles, pleased at the outcome. On an early weekday morning, Contilo Pandeleon is sitting at an empty table at Symposium. At 57, she is a robust woman with a pile of blond hair, sad blue eyes, a gold Byzantine cross on a chain. She is expressive, even candid. Nikos is in the kitchen, kneading the pizza dough, a chore only he is allowed to do. He is 59, short, compact, grizzled, a straw cap on his pink head. Before greeting a visitor, Nikos wipes a beefy hand on his apron for what seems an eternity. He is painfully polite, forthright, humble. Their son Yiannis, also works in the restaurant. He started washing dishes at 11. Now 28, he will soon take over the place. This is the Greek way. Symposium features a homey atmosphere with pictures of colorful Pargiano fishing boats, classic Greek murals and an array of family photographs. There are several of Miltiades, white-haired and handsome. "Always a big smile," says Contilo, gazing fondly at her father's portrait. One mural is of a Greek woman baking bread in a brick oven. "Our idea was to do a Greek restaurant with pizza," says Contilo, explaining their hybrid cuisine concept. "We thought if families came here, there would be something for the children. The Davis people called it ' Greek pizza.'" Think of feta instead of mozzarella. Along with familiar, traditional Greek items such as dolmas, mousaka, souvlaki and spanako tiropita (spinach cheese pie), Symposium, in trying to be faithful to its depths, offers a range of dishes popular in the Cyclades, a sprinkle of sun-bleached islands that are havens for tourists. With the restaurant established, Contilo gradually expanded into catering. She mostly did events for Sacramento's fun-loving, 7000-plus Greek community, family celebrations such as christenings, Greek Easters, weddings and anniversaries. At any Greek party, there must be a table of food as tall as Parnassus. A major customer and benefactor remains Angelo Tsakopoulos. "Angelo always wants the same thing -- lamb chops," says Contilo with a knowing smile. "He calls them 'Greek lollipops.'" At the May fund-raiser, so busy was Clinton pressing the flesh that he never had a chance to eat. So just before he left to catch Air Force One, Contilo prepared Clinton a heaping plate to go. "As soon as he got in the car, he started to eat," she recalls with absolute certainty. "We should have taken his picture." Though the Clinton fund-raiser is Contilo's most publicized bash, it was small potatoes next to her biggest, most challenging order -- the christening party of Angelo and Sophia Tsakopoulos' daughter in 1985. This was a party of Olympic proportions. There were 1000 invited guests and many more uninvited. The menu included lobster, crab, salmon, a lamb on a spit and, of course, Symposium's marinated lamb chops. There were five buffet tables, four barbecues, 15 cooks, a serving staff of 50. "I think back it was nerve-racking," says Contilo. "But everybody talked about it. I think it was the party of the year." Since then, Contilo Pandeleon has catered numerous business and political affairs for Tsakopoulos, who entertains lavishly. "I know what he wants," she says. "I think he feels comfortable with me. He is proud of Greek culture." Contilo, too, cherishes her heritage. When her father died some years ago, he left her a piece of property on Paros. She and Nikos built a small home of white stone with blue trim, the colors of Greece. Now, after working since she was 8 years old, after enduring hardships and separation abroad, after never taking a vacation for the past 20 years, she and Nikos can return home as grateful tourists for a few weeks at a time. There is a cozy cafe on the island called Miltiades. It is run by a nephew. One can almost imagine a little Greek girl playing the phonograph. "It has been hard," she says of her life. "It has not come easy. We are not rich, but we are comfortable. I don't think anyone gets rich running a restaurant. I thank God for giving me the opportunities to do the things I have done. I am thankful to the people who have helped me."